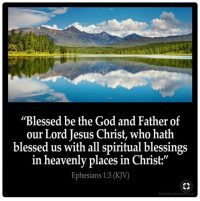 “Blessed be the God and Father of our Lord Jesus Christ, Who blesses us with all spiritual blessing in heavenly places in Christ” (Ephesians 1:3). Who (the God and Father), us (the blessed ones), and him (Christ) — He, us, and him! “Blessed be the God and Father of our Lord Jesus Christ who in Christ has blessed us with every spiritual blessing in the heavenly sphere!” (Moffatt NT).“Praise be to the God and Father of our Lord Jesus Christ for giving us through Christ every possible spiritual benefit as citizens of Heaven” (J.B. Phillips). That is a tremendous verse of scripture. I guess that I have repeated that verse thousands of times. I memorized it from the King James Version over six decades ago. If there is one verse of scripture that sums up all the excitement of what God has done for me, it would be Ephesians 1:3. Here in this magnificent verse we have a summary of the wealth that God has given to all believers. Let’s start at the beginning. One writer makes the point concerning verse 3 that “No blessing is sought or desired, ‘all blessings’ are acknowledged. The opening words of this glorious revelation are not ‘may I be blessed’ but ‘may He be blessed.’” The words “blessed” and “blessing” literally mean “to speak well of” and occur only rarely in Paul’s epistles. Paul continues verse 3 by describing what is the wealth that the believer has in Christ: “Who blesses us with all spiritual blessing.” This statement contains a vital key to our understanding of the Father’s blessing — it is spiritual. His blessing is not a material benefit but a spiritual blessing, produced and given to us by God, Who is Spirit (John 4:24). Yes, he “blesses us with all spiritual blessing…” The responsibility for how you apply God’s blessing is on your shoulders. You are in a continuous state of being blessed, but are you enjoying it? You are “blessed with heaven’s best,” but are you applying it to your needs and helping others with their needs? The wealth that is described, then, is spiritual blessing. One of the motivations of my ministry is to help believers discover and enjoy “all spiritual blessing” and so produce a more abundant life. Let us notice further in verse 3 the word “all.” Could there be any spiritual blessing that you and I do not have? No, for unless “all” is qualified, it means “all,” “the whole.” It is what is called a “distributive determiner,” for those who love grammar. When this great truth soaks deep into your mind, you can really start enjoying your Christian life. When you fully realize that you are totally blessed, you will no longer want to chase after another person’s experience. You are blessed with all spiritual blessing. Where is this wealth located? “In heavenly places in Christ…” (Ephesians 1:3). Now the problem is that you and I live on the earth, and our thinking is usually strongly influenced by this fact. We live on earth, yet verse 3 declares that His blessing is in heavenly places or the heavenlies. How do we line up the two? Where is heaven? The Biblical usage of the term means the air around you. We must let go of the concept that the heavenlies are up there, somewhere. “The heavenlies” is another term for the spiritual realm, and that is everywhere around us and in us. Our blessing is not a pie in the sky, but in the “heavenly realm” (AMP), the unseen spiritual realm. It is unseen to you, so you must change your thinking to agree with what God has said in his Word (Romans 12:2). Remember also that the spiritual realm is not in the future; it is always right here in the now. 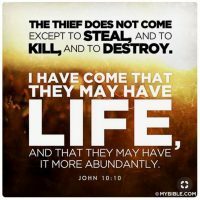 This is why I encourage you to read and believe the Word of God and know that you are blessed! Finally, the wealth of the Christian is deposited “in Christ.” Some 114 times in Paul’s letters this term is used to describe your position. Right now, God sees you as being “in Christ.” He does not see the old Peter Wade; he sees Peter Wade wrapped in Christ. It is because I am in Christ that I have “every spiritual blessing.” It may not be logical to the five senses, but it is great spiritual truth. I do not need a theological course to be able to enjoy the benefit of being “in Christ” and having “all spiritual blessing.” Let’s believe what God’s Word declares! Let’s learn how to keep the blessings flowing in our lives! As we do this, some understanding of what is involved may come to us, but let’s not wait to get a grasp on the understanding first.